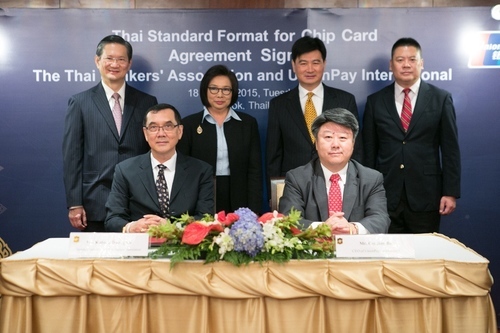 On August 18, UnionPay International and Thai Bankers Association signed Chip Card Standard License Agreement in Bangkok, according to which the chip card standard of UnionPay will be introduced to the local banks as the standard of Thailand’s banking industry. 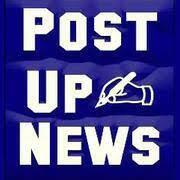 Thailand has become the first overseas nation which adopts UnionPay standard as its local uniform chip card standard. Ge Huayong, Chairman of UnionPay International, Tongurai Limpiti, Vice Governor of Bank of Thailand, the Economic and Commercial Counselor of the Chinese Embassy in Thailand and the head of the Chamber of Commerce of Chinese-invested Enterprises in Thailand attended the ceremony. Cai Jianbo, CEO of UnionPay International, and Kobsak Duangdee, Secretary General of Thai Bankers Association, signed this agreement on behalf of the two sides. In 2014, with the review of Thai Bankers Association and major commercial banks, UnionPay chip card standard became the recommended standard for acceptance and card-issuance of Thailand’s banks. For one thing, it shows that China has achieved significant breakthroughs in independent financial technology and standard export. For the other, it enables Thai residents to enjoy safe and convenient payment experiences of “UnionPay Chip” in their home country and the global UnionPay network, which also plays a demonstrative role for the chip upgrade in other markets. UnionPay chip card standard, compatible with the international EMV standard, is an international standard featuring security, convenience and rich application etc. Nowadays, overseas chip migration of acceptance terminals outside of mainland China is in progress and UnionPay composite cards with both chips and magnetic stripes are basically accepted worldwide. UnionPay Quick Pass is an innovative service of contactless payment based on the chip card and consumers can pay quickly at over five million Quick Pass terminals worldwide. According to Ge Huayong, on the occasion of the 40th anniversary of diplomatic relations between China and Thailand, the bilateral communication and the implementation of “Belt and Road Initiative” strategy will be enhanced with standard cooperation in the Thailand’s payment industry upgrade. The cooperation through license agreement benefits from a number of factors. First, with the implementation of the strategy of “Belt and Road Initiative”, economic and financial exchanges between China and Thailand are much closer. Second, UnionPay chip cards have great advantages in technology, brand as well as services. Third, UnionPay cards are widely used in and around Thailand, which has enhanced understanding about UnionPay brand as well as its chip card products. In the future, we will deepen our cooperation with the association and local banks, optimize the local acceptance environment and push forward issuance and innovation of UnionPay cards so as to provide more secure and efficient services to cardholders. According to Tongurail Limpiti, China-Thailand friendship has a long history. 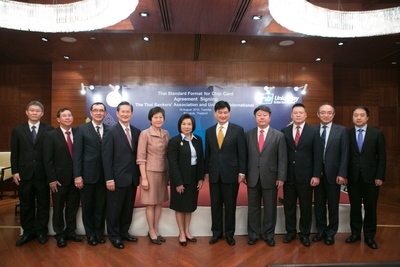 The cooperation on the local chip card standard between UnionPay International and Bank of Thailand and Thai Bankers Association is an important groundwork which will benefit financial cooperation of the two countries. Kobsak Duangdee expresses thanks to support from UnionPay International for Thailand’s chip card standard development and hopes that Thailand’s services level of the payment industry will be further promoted with the help of the UnionPay’s global acceptance network and the leading innovation technology. Now, UnionPay cards can be used in nearly all ATMs and almost 70% of merchants including large department stores, airports and downtown duty-free shops, 7-11 convenience stores, chain supermarkets, dining hotels and tourist attractions etc. in Thailand. The ten ASEAN members have also realized the acceptance and issuance of UnionPay cards. The local residents in Singapore, Malaysia and Thailand use UnionPay cards frequently in their daily purchases and their international travel.